Thick, flattened, and strap-like axes (each referred to as a rachis), with numerous small, lateral blades (can be flat, broad, narrow, filiform to cylindrical) and floats along the margin. Thallus arises from a dense, hapterous holdfast which can become fleshy and cone-like in large plants (Abbott and Hollenberg 1976). Thallus morphology approximately correlated with geographic distribution: northern populations (Alaska to Cape Mendicino) have tuberculate rachi, smooth sporophylls, and narrow, thick spatulate laterals (Blanchette et al. 2002); populations from Los Angeles to Baja California have smooth rachi, wrinkled sporophylls, and both broad, spatulate and narrow, filiform laterals; populations located in between have mixed and variable morphologies; southern California thalli initially produce spatulate laterals but then begin producing filiform laterals as they grow (Henkel 2003). 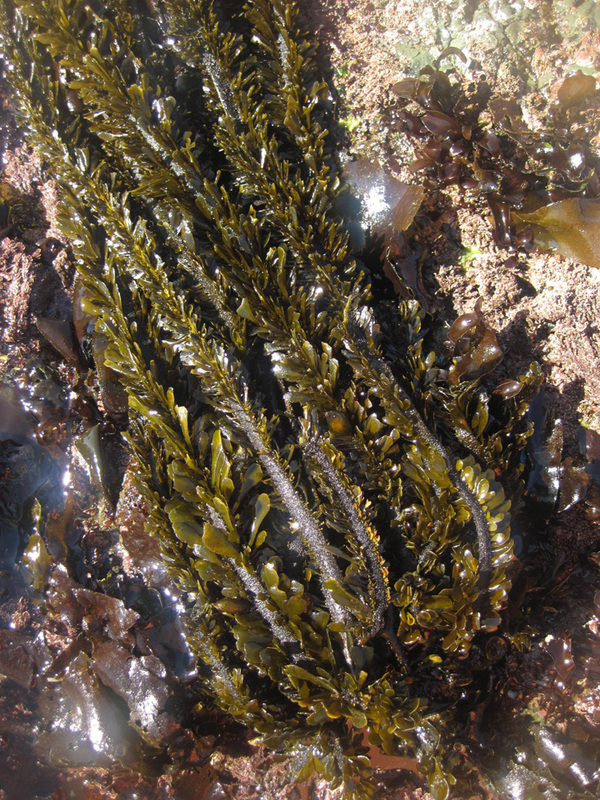 Common on lower intertidal rocks, in protected to moderately wave-exposed areas from mid- to subtidal (20m), E. menziesii is often found mixed with Macrocystis at the inner edges of kelp beds as well as growing in mixed stands with Phyllospadix spp. This species inhabits a geographic range from Alaska to Punta Eugenia, Baja California (Abbott and Hollenberg 1976). Juvenile Eisenia arborea is corrugated on the blade surface, whereas Egregia is smooth (southern) or uncorrugated and tuberculate (northern). Egregia is one of the most conspicuous algae in the intertidal zone. It provides shelter for many species of understory algae and invertebrates (Humphrey 1965). Notoacmea insessa is a limpet only found on Egregia, where it grazes on the rachis, producing oval scars or pits. 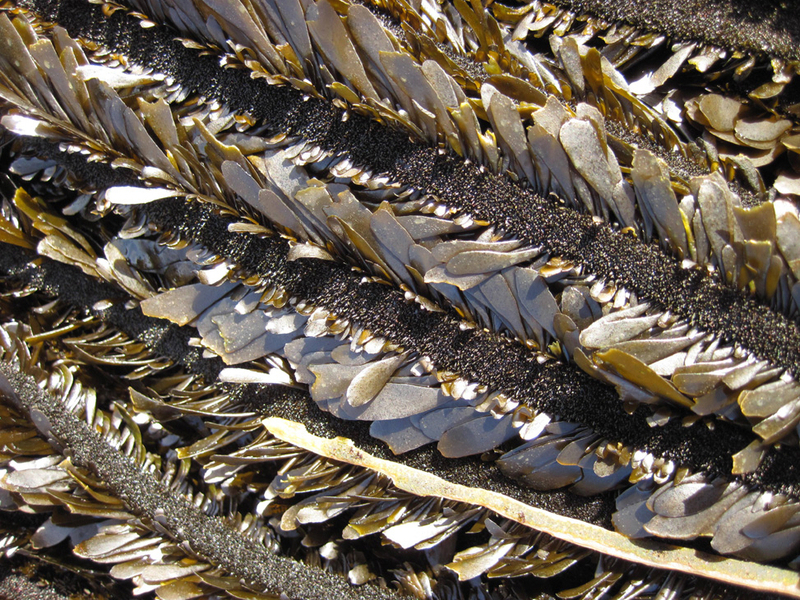 This grazing activity can result in axis breakage and cause mortality in the kelp (Black 1974). Egregia is sensitive to desiccation and heat stress on the lowest midday tides (Engle and Davis 1996). High mortality has been associated with warm water events, such as during the 1982/83 El Niño period (Gunhill 1985). Poor water quality might also affect Egregia, as it was noticeably absent near a sewage outfall (Littler and Murray 1975). If recruitment is successful, recovery of Egregia populations can occur in as little as five months to 2 years due to fast growth rates (Murray and Littler 1979, Vesco and Gillard 1980).